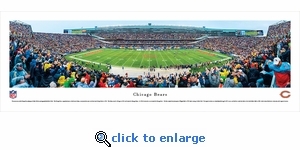 This panorama of the Chicago Bears playing at Soldier Field was photographed by Robert Pettit. 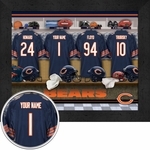 The Chicago Bears, originally known as the Decatur Staleys, were founded by owner and head coach George Halas in 1920. The Staleys moved to Chicago in 1921 and became the Chicago Staleys. 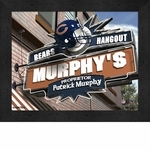 In 1922, the franchise was renamed the Chicago Bears. The Bears played their final game at Wrigley Field in 1970, before moving to Soldier Field. The original stadium was demolished following the 2001 season, and the Bears made their debut at the rebuilt Soldier Field in 2003, which retained the historic colonnades of the original structure.